Recently The Guardian reported that in 1945, at the behest of the Ministry of Information in Britain, Agatha Christie wrote an essay lauding the excellence of British crime fiction. In what was essentially a piece of post-WWII propaganda meant to showcase the English culture and way of life, Christie did indeed lavishly praise several of her contemporaries, including Ngaio Marsh, John Dickson Carr, and Arthur Conan Doyle. 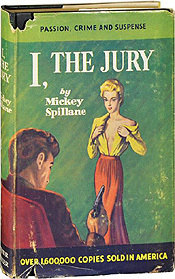 Apparently reluctant to be entirely glowing and gushing, she also included some less flattering words for fellow crime-writer Margery Allingham, whom she charged with over-developing her characters at the expense of the plot, and for Dorothy L. Sayers, whose recurring character Lord Peter Wimsey was a good example, Christie asserted, of “a good man spoilt”, and that any early interest he held was eventually replaced by run-of-the-mill handsomeness and dullness. Poirot is far from alone. There are numerous fan clubs, both physical and electronic, dedicated to fictional detectives (fic-dicks?). Whether police detectives, private eyes, or amateur snoops, readers eat them up. The same Peter Wimsey whom Dame Agatha was so rough with above has countless fans all over the globe, and stacks of copycat fan fiction written about him by admirers. Likewise Sherlock Holmes, Nero Wolfe and Mike Hammer. Something about the detective genre seems to inspire the creation of long-lasting repeat characters, heroes in possession of varying ratio of admirable qualities and flaws, to whom readers everywhere can relate. We get to know them, and glimpse what makes them tick. We cheer for them, we fear for them, and we look forward to their next adventures. Some sleuths have been collaborative efforts as well, coming from more than one contributing mind. The most obvious example is keen-teen sleuth Nancy Drew, the amateur adolescent whose investigative adventures have intrigued gaggles of pre-teens for generations. Nancy Drew’s creator is listed as Carolyn Keene. Keene, along with The Hardy Boys’ series author Franklin W. Dixon, doesn’t actually exist. Both are collective publishing pseudonyms created by the Stratemeyer Syndicate, a book-packaging firm who puts out the stories, which have actually been written by a collection of ghostwriters. However, both The Hardy Boys (since 1927) and Nancy Drew (since 1930) have gained popularity and loyal devotees, eagerly following their next clue alongside them. It was always a special treat when a book included both Nancy Drew and The Hardy Boys teaming up to solve a particularly stubborn case. Even the more dark and hardboiled detectives have their admirers. These anti-hero types were the antithesis of the wholesome, fresh-faced appeal of Nancy Drew and her cohorts. They too investigated crimes and mysteries, but the superficial similarities stopped there. These gritty gumshoes knew their way around guns, and were as often as not halfway to the bottom of a whiskey bottle. They were not afraid to get rough with an informant or give a hysterical dame a good shake when necessary. Two of the most well-known of that ilk are Dashiell Hammet’s Sam Spade and Raymond Chandler’s Philip Marlowe. Interestingly, Humphrey Bogart played both of those characters in film adaptations. A fun variation on the theme is the little old lady, most famously personified by Agatha Christie’s Miss Marple. Jane Marple is an elderly unmarried woman, deceptively innocent in appearance and demeanor, who uses her keen intelligence and ability to go unnoticed to her advantage when solving baffling crimes and grisly murders. Another excellent example is Emily Pollifax, the title character from the series by Dorothy Gilman. Technically a spy, Mrs. Pollifax is a vaguely depressed aging woman at the beginning of the series, who finds herself enormously cheered and revitalized after a series of misunderstandings lands her a job with the CIA and sees her sent off on a wildly unbelievable mission, ending up in Albania, which (naturally) she happens to survive, while tidily solving the mystery and landing herself a job in the meantime. Whether your preference is debonair and dashing, deceptively demure or downright dastardly, there is a fictional detective to fit the bill. If the genre is anywhere near as much fun to write as it is to read, it’s small wonder we’ve so many to choose from. Who is your favorite fictional detective? Why?